The following are the most frequently asked questions about the use and management of our Summit Array of software products. Running Summit on the "Cloud"
Q: What hardware and operating system software are required for Summit? A: Each station must have Windows® 7 or higher, video accelerator card, at least one sharable CD-ROM on the network and one laser- or ink-jet type printer, and depending upon operating system 256 MB (Win/XP) to 512 MB (Vista) to 1 GB (Win7/8/10) memory (minimum). For networking, a 100 Mbps (high speed) router or switch is recommended instead of using a hub. 1 Gbps (ultra speed) network cards, cables, and router would further improve performance, especially important with larger databases and networks. Server requirements are similar. Windows Vista/7/8/10 have their own requirements, which can be found on the Microsoft® web site or through your computer retailer. Mac® users must currently install Parallels® or run BootCamp® to run Summit within Windows. (Stay tuned for an improved approach for Mac® users!) 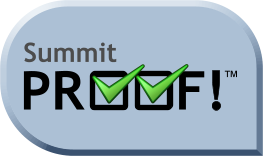 Summit ships with a run-time version of Microsoft® Access, which means that once you have the computer and Windows, you're ready to install and run Summit! Q: How do I license the software? Q: What's included with my software license? A: See Software Licensing Options for details. Q: Can I run the Summit software on the "Cloud"? A: Yes! If you have remote users, various offices sharing data, or just want to relieve yourself of the worries of maintaining your own computer network server, a cloud server is a great option. With one small change, we can even optimize performance for remote server access. You just have to have fast and stable Internet connections, and you're good to go! Some services offer remote backup of your data and program automatically. This is a critical feature, but keep in mind that you usually pay for each element of their service. Depending upon your choice of vendor, it can start at around $30 per user. Ask us for specifics as you begin your price shopping to ensure you get what you really need and not over-pay. Q: How can I obtain training and technical support? New licensed users receive 60 days of unlimited free training & tech support, via email, telephone or internet connection (starts at program activation). After the initial 60 days expire, licensed users are provided a training & tech support allowance of up to 30 minutes each month (combined). Additional training is available for an additional cost and charged in 10 minute increments, as needed. On-site training or training at Ritam's offices is available for an additional cost. Dedicated training time must be scheduled in advance. After the initial 60 days expire, licensed users subscribed to the annual Continuity Plan are provided a training & tech support allowance of up to 30 minutes each month (combined). Technical support is charged in 5 minute increments, as needed. Dedicated technical support time must be scheduled in advance. Q: How do I obtain updates and upgrades on my program? A: Updates (when available) are for program warranty issues. Updates are included for the current product version only. Upgrades differ from Updates. Upgrades are new versions that include enhancements of the program and are available automatically to Monthly Licensing or Continuity Plan subscribers and for a separate charge for others. Q: My initial 60-day training video access is almost up; what are my options for continued access? A: You have two options: 1) Subscribe to Monthly Licensing or 2) Subscribe to the Continuity Plan (below). Q: How do I upsize my program edition? A: If you licensed the software through Standard Licensing, you will receive credit for your original licensing purchase when you upsize to the next edition (i.e. Lite to Plus, Plus to Pro, Pro to Deluxe, or Deluxe to Premium), and you will only need to pay the difference. If you licensed the software through Monthly Licensing, you simply start paying the monthly cost of the next edition. We will provide the latest version with your upsized system. Please contact us to make the necessary arrangements. Q: What is the Continuity Plan? A: A 12 month, renewable, discount subscription plan which allows users to keep their program current on a constant basis. See Software Licensing Options for additional details.